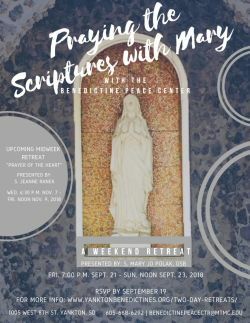 Praying the Scriptures with Mary is a 2-day retreat offered by the Benedictine Peace Center in Yankton, Friday evening Sept. 21 to Sunday afternoon. How did Mary and Jesus pray? Learn from them as you delve more deeply into the Scriptures behind the Joyful, Sorrowful, Glorious and Luminous mysteries of the Rosary. Increase your appreciation of the Rosary and the practice of meditating on the Scriptural themes of each decade through this retreat led by S. Mary Jo Polak. For more information and to register by Sept. 17, go to https://yanktonbenedictines.org/two-day-retreats/ or contact benedictinepeacectr@mtmc.edu or (605) 668-6292. Sep 21, 2018 6:30 pm - 7:30 pm Check-in: 6:30 p.m. Friday; Retreat begins 7:00 p.m. Friday to Sunday, 1:00 p.m.